In a previous Web clinic, Flint McGlaughlin, the Director of MECLABS Group, taught five steps to help you optimize your company’s homepage. We intentionally left one key aspect of optimizing homepages out of that clinic because we felt it deserved special attention. So, for the September 30 clinic we focused exclusively on Step 4: Design the homepage to weigh objectives strategically according to priority. However, the objective of this clinic was not to provide one-size-fits-all design tricks and tips. Instead, the objective is to describe the MarketingExperiments way of thinking about homepage design, rooted in our optimization methodology. By applying the principles in this clinic, you will be able to optimize your homepages according to the specific objectives you had identified and visitor profiles that your homepage receives. Trying to achieve too many objectives – It is critical that you use visual elements to focus the visitor on a small number of initial objectives, so that the visitor is not confused about what they can do on your site. Over-reliance on multimedia to communicate value – Anything you can say through video or audio, you can say quicker and more efficiently with text; do use multimedia, but dont rely on it to communicate, especially in those precious first seconds of your interaction with the visitor. Your visitors are probably not patient enough to wait for even a one-minute video to explain why they should stay on your site. and then let the subsequent page(s) do the selling. Assuming best practices will work for you – best practices, even if they work in most cases, dont work in every case. You must test your pages, including homepages, to determine whether any change or intended “optimization” actually had a positive effect. Industries, products, and traffic channels are different in each situation, and the results may surprise you. 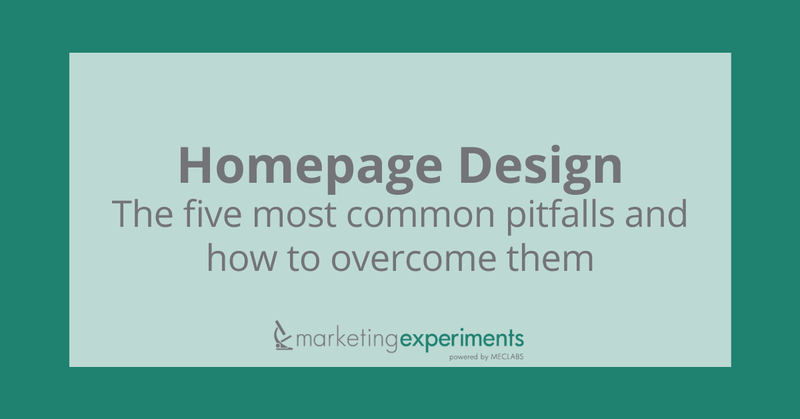 In addition to teaching these pitfalls, Flint McGlaughlin and the MECLABS Conversion Group team conducted live optimization of audience-submitted homepages – real-world examples to help our audience understand how to apply these lessons to their own homepages.